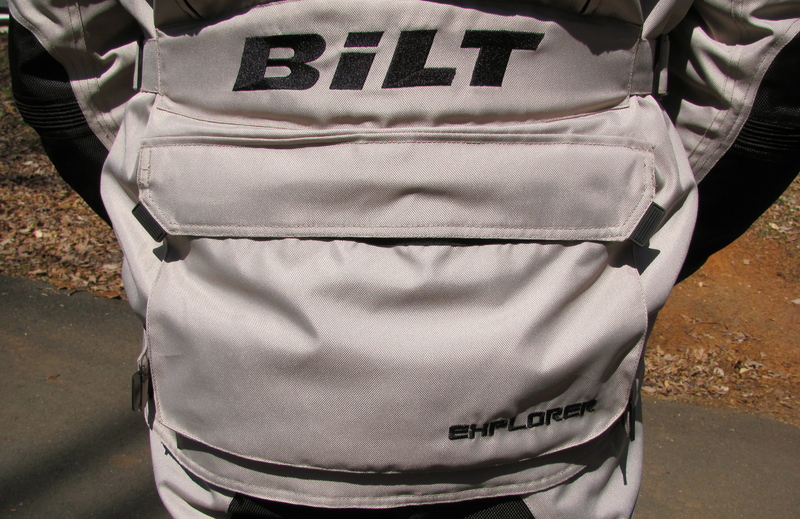 “Apollo Modular Helmet, didn’t you write that you picked up the BILT Explorer Adventure helmet?” Yes, I did get the Explorer helmet as part of the package deal with the BILT Explorer Adventure Waterproof jacket but when I went to my local Cycle Gear store to exchange my too large BILT Explorer Adventure pants I also traded in the Explorer helmet for the Apollo. The Explorer was just too off-road for me and I felt that the Apollo fit me and my riding better. I’m happy to say that I made the right choice. The features of the Apollo read like most modular helmets these days. Single pushbutton chin bar release, internal sun shield, optically clear face shield, double d-ring chin strap with snap stay, chin and top vents, rear exhaust vent, removable lining, polycarbonate shell and a nice bag to store it in. 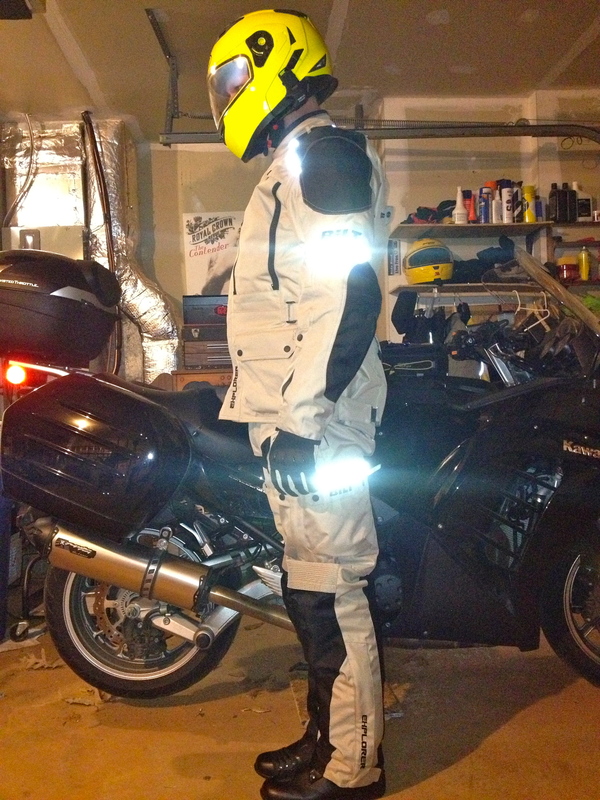 I chose the HI-VIZ color with black accents. From my first ride this helmet fit me, my head and my riding style. The chin bar mechanism is smooth but takes a firm hand to open and latch closed. This is doubly true for the face shield, it’s a bit stiff and takes some effort to raise and lower. There are plenty of detentes in the face shield, the first opens the shield just enough to keep fogging down to a minimum. The chin vents also move enough air, once in motion, that I can feel it on my chin and it clears out any fogging. Two top vents also flow decent air that I can feel while in motion, which is more than I can say for most helmets I’ve owned. I’ve ridden this year in tempts ranging from 30 to 85 degrees and it’s been as comfortable as most helmets and more so then some I’ve worn. I am also impressed with how smooth the airflow over the helmet is. The Apollo is not a quiet helmet. There’s a good deal of wind noise but with the face shield down and the chin curtain it’s less than you’d expect. I’ve noticed a high-pitched whistle at times that seems like it’s coming from the shield where it meets to helmet. I only hear it when turning a hard corner so it’s not constant. I barely notice it with my ear plugs in. Overall wind noise is not loud enough that it will be a drain on a long ride. Weight seems reasonable. It’s not carbon fiber but it is lighter than my Nolan n103. I choose the XL over the large, which is my normal size in Nolan and HJC, as it fit better. Even with the XL however I don’t have room for my helmet liner, but that’s not a great loss. I have a beard and so am particularly susceptible to my chin and neck hair getting pulled by the chin strap if it’s not padded well. No such issues with the Apollo. Both sides of the chin strap are well padded. 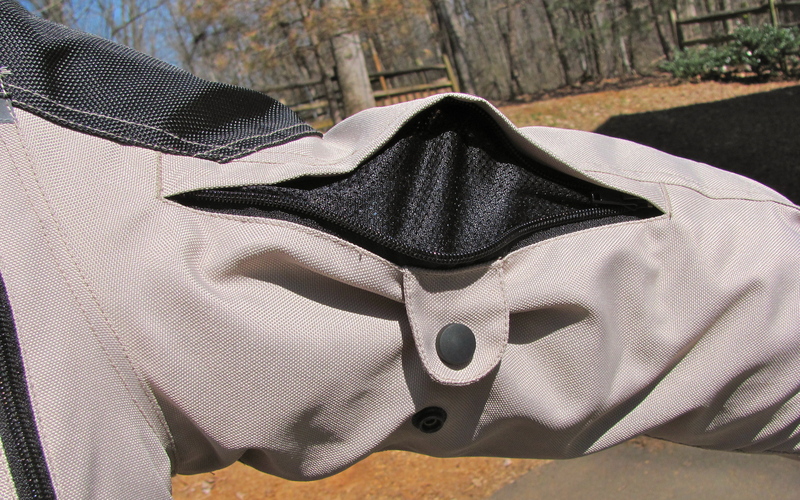 When pulled together through the D-ring the padding comes together and stops the strap from chafing my neck. I was able to attach my Sena SMH10 to the Apollo. The internal sun visor and shape of the helmet made this a little tricky but it works well. 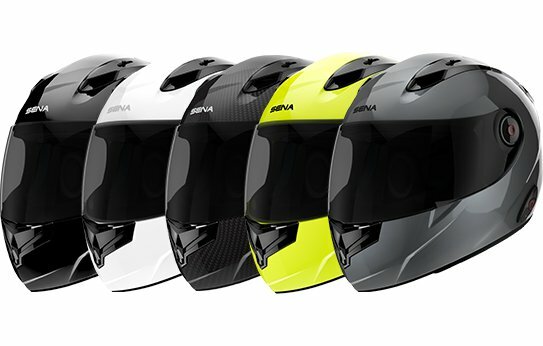 The Sena mounts a littler farther forward on the helmet then I would like, though. The mic tucks into a little pocket in chin bar and stays out of the way when riding which s a plus. I don’t use the internal speakers as I opted for the base plate that lets me use ear buds. I can’t comment on speaker installation in the Apollo though it looks like it would not be hard. The liner is removable (and washable). I’ve been on several rides now with the Apollo helmet and am very satisfied with it. It feels and looks solid and well built. For the price I believe this is one of the better helmet choices out there, especially for a new rider looking for extra protection without the extra price. It’s certainly a lot nicer than the $100 Fullmer full face that was my first helmet. Motorcycle gear is expensive. There’s no way around it, usually. I cannot begin to count the number of gear reviews that have excited me about a particular piece of kit and then brought back to reality when I see the price. In all of this reading I’ve yet to see a review of some of the less expensive gear out there. Even when I went to research Cycle Gears house brand BILT I was only able to find message board reviews. So I thought I’d take the plunge, buy the gear and see for myself if it’s inexpensive or just cheap. 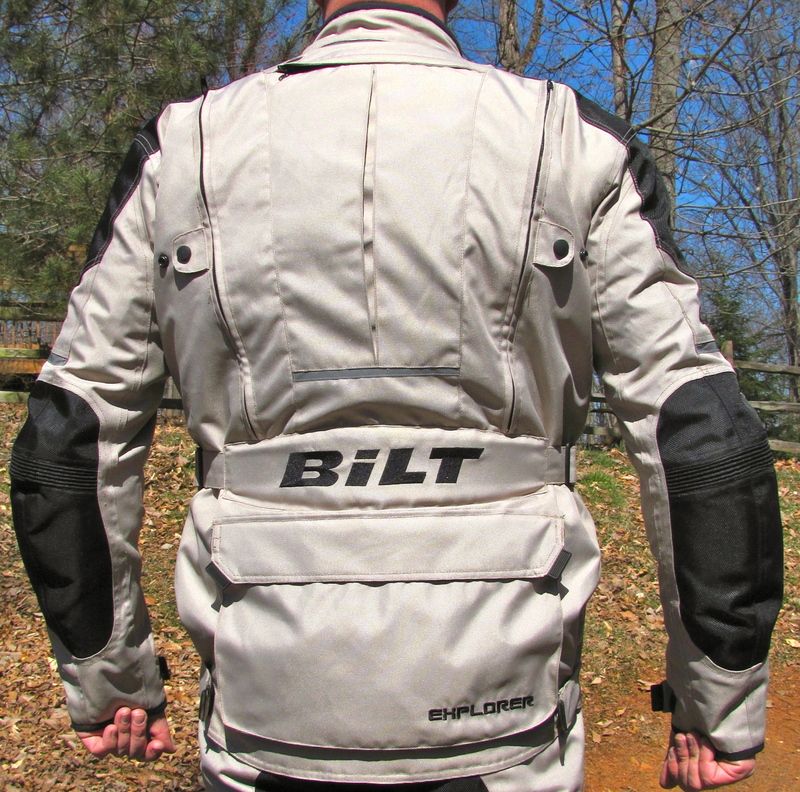 I’ll start with the BILT Explorer Waterproof Adventure Jacket (formerly the BILT Explorer H2O Waterproof Adventure Jacket). 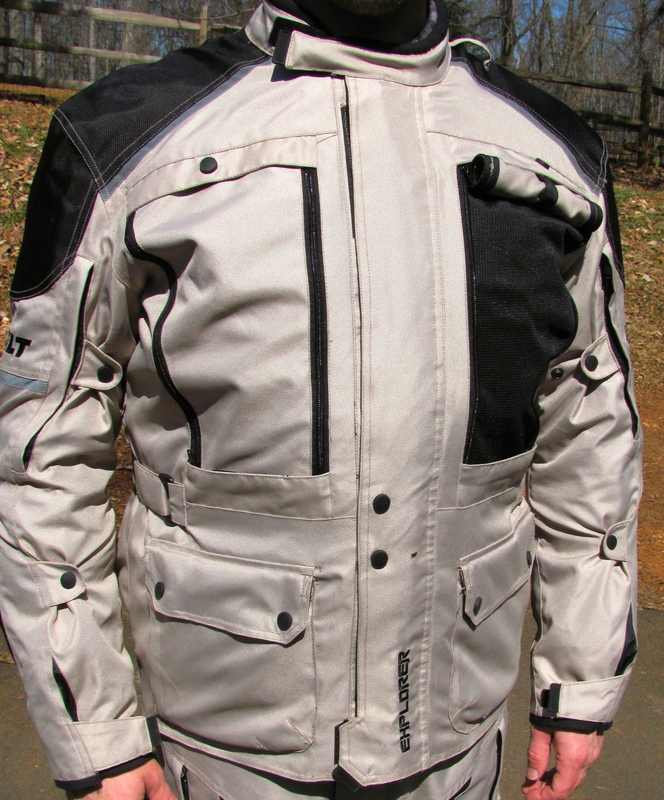 The Adventure jacket is 3/4 length and made of a 600 denier PRO-FLEX™ outer shell with 1200 denier ENDURA-BRADE™ shoulder and elbow panels. It’s lined with a non-removable DRY+™ 100% waterproof lining, a removable quilted liner and removable CE approved armor at the shoulders and elbows. The 600 and 1200 denier material is highly flexible and light weight making the jacket comfortable with no break-in time at all. In fact it feels light enough that I really appreciate the 1200 denier fabric added to the shoulder and elbow areas. I cannot tell because of the inner liner, but it seems that the 1200 denier patches are sown inline with the 600 denier fabric of the jacket and not sown as an added layer over the shoulder and elbow. This was a little disappointing because I expected these areas to have a layer of 600 and then 1200 denier fabric for added abrasion resistance, but that is not the case. My attempts to find out what the PRO-FLEX™ or ENDURA-BRADE™ materials are actually made of has turned up little information. They are not Cordura or ballistic but are a lighter nylon or poly fabric similar to a duffel bag or backpack. This will be nice in the summer as it’s lighter fabric weight but I’m not certain of their abrasion resistance because I can’t find the exact base material used. Out of the box, the construction is decent but there were a number of loose or hanging threads that I needed to trim. The seams are double stitched, which is good, but I noticed a few missteps here and there where the seams didn’t get put together with the greatest of care. This is particularly noticeable around the hook-and-loop patches, zipper folds and at the ends of the roll-up front vents. For the most part these areas show some pretty sloppy sewing and I fear that I’ll be repairing them before the jacket’s end of life. The important thing is that where I would be likely to contact the road the seams are in good shape. There’s a noticeable lack of finishing the product off well which I suspected might be the case for this price point. The thread used on the seams is regular cotton thread and not nylon or another stronger material. So while I expect that in a get off the jacket material and armor will hold up well, the seams are pretty likely to fall apart fast. The Adventure jacket fit better than I expected. I’m 6′ 2″ and 210 and I bought the XL. It fits everywhere as good gear should. There are adjusters on the arms to help pull the elbow armor into place and hold it there. 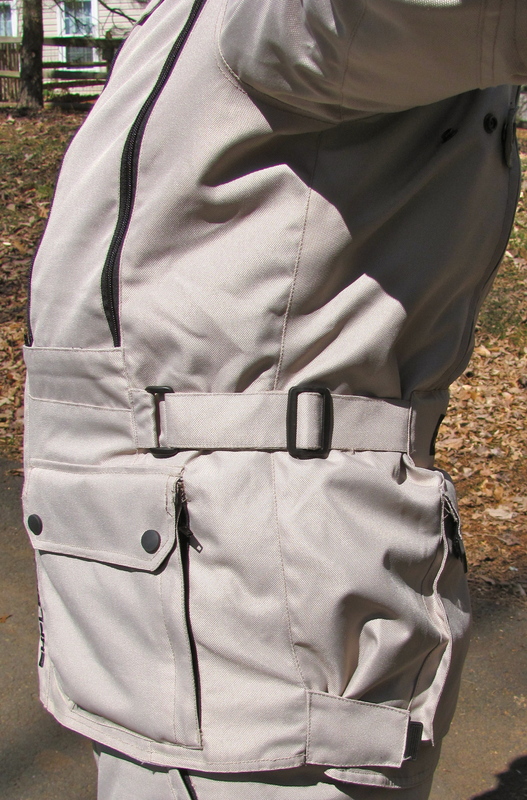 Adjusters at the waist help snug up the middle. The neck closure is lined with a soft neoprene-like material and closes with some room left over if needed but tight if wanted. Down the front of the jacket there is a full length zipper enclosed by a rain gutter that secures via both hook-and-loop and snaps, which I really liked for reasons that I’ll get into later. The zipper was easy to pull the first time. With the quilted liner in place the fit is a little snug, but it keeps the liner close to the body and I suspect will keep me toasty. Sleeve length is perfect for my reach to handle bars (sitting test only). The hook-and-loop closures on the end of the sleeves, and the end of the sleeves themselves, could do with a bit more refinement in design. While the closure allows me to wear a glove either over or under the sleeve end, there’s a lot of excess fabric. This fabric causes a loose seal around a glove worn under the sleeve which may let in cold air. It also bunches up fabric under a gauntlet that may prove uncomfortable over a long day. Both of these I will need to test in riding conditions to see how they affect my riding comfort. For cold weather comfort the Adventure jacket comes with a removable quilted liner. This is a pretty standard liner similar those found in my other riding gear. It has two inner pockets and is easy to remove and packs small. 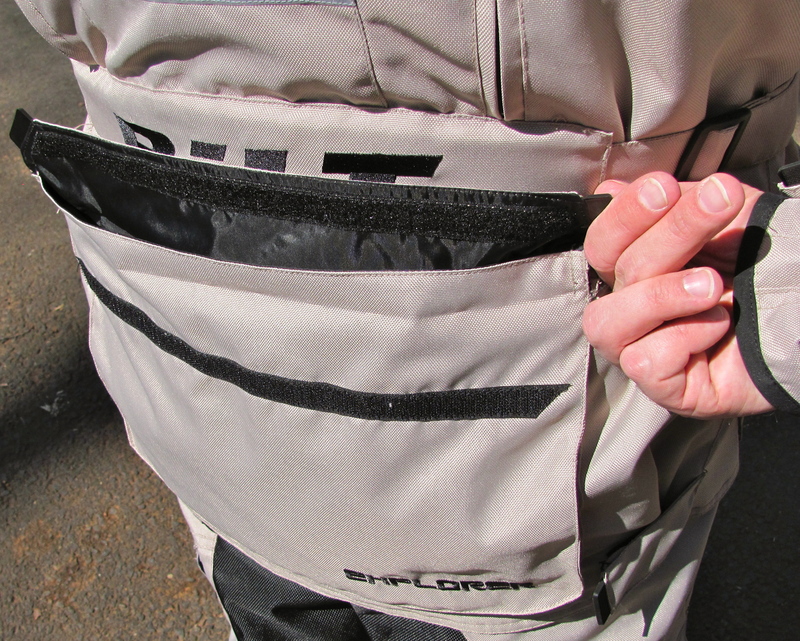 When the days start to warm up the Adventure jacket has six vents. There are two arm vents and two rear vents with snap pulls to hold them open. 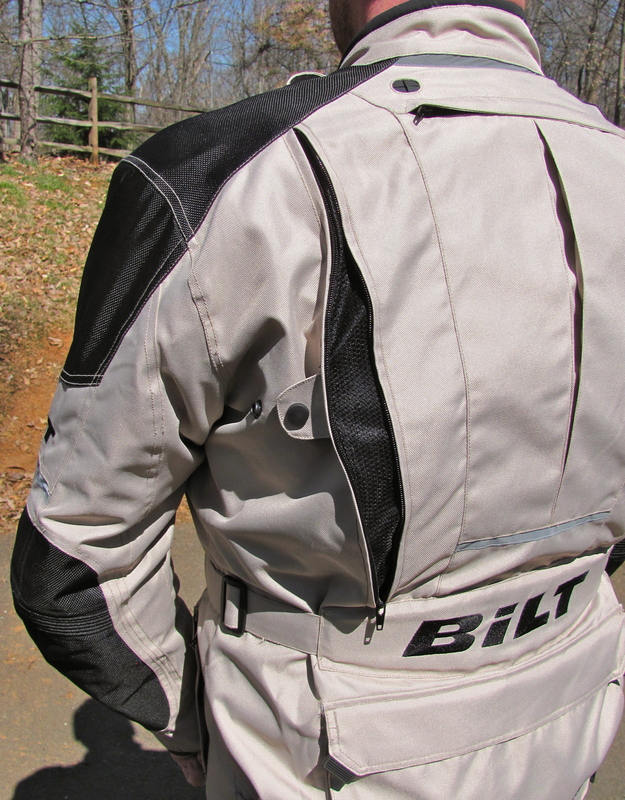 On the both sides of front of the jacket are roll up covers that expose shoulder to torso vents that should pass a lot of air over the rider. I will note that all these vents open to the inner waterproof liner and not directly to the rider. 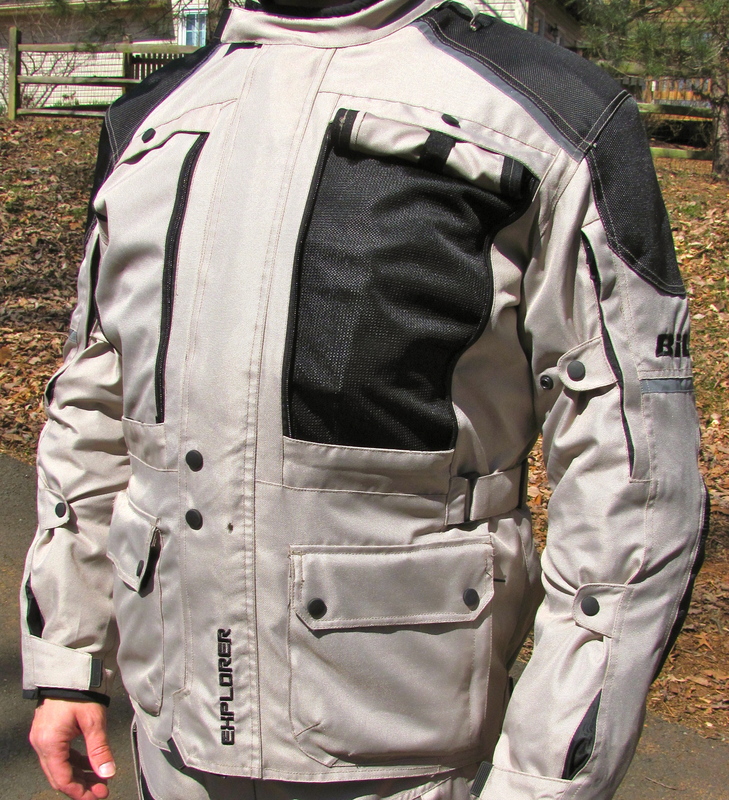 This is similar to another riding jacket that I have and isn’t horrible for cooling me down but does need air flow for it to work. I imagine sitting still will be hot, but then that’s the case even with my mesh jacket. In regards to venting a summer heat I was actually really impressed with one particular aspect of the front zipper closure. I mentioned before that this closure secures via snaps and hook and loop. The snaps sit right in the middle of the main closure and allow me to open the main zipper about halfway down. With the hook and loop closure at the neck having the hooks on the pull tab and the main zipper closure having the loop on the right side of the storm flap I can secure the neck pull tab to the storm flap so that it’s not flapping in the wind. This will offer direct venting to me and should help on the hottest day. Whether this was intentional or not, I’ll call it a feature and enjoy the breeze. Pockets there are a plenty. 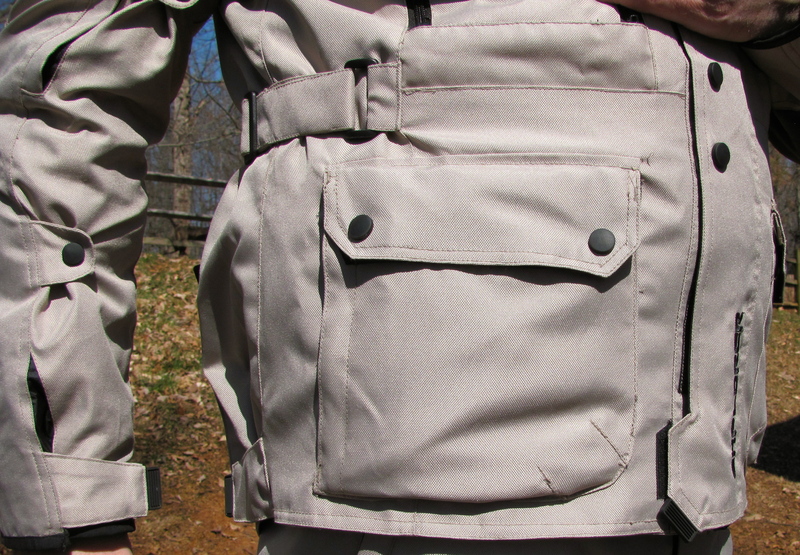 In the removable quilted liner there are two pockets, one on each side. 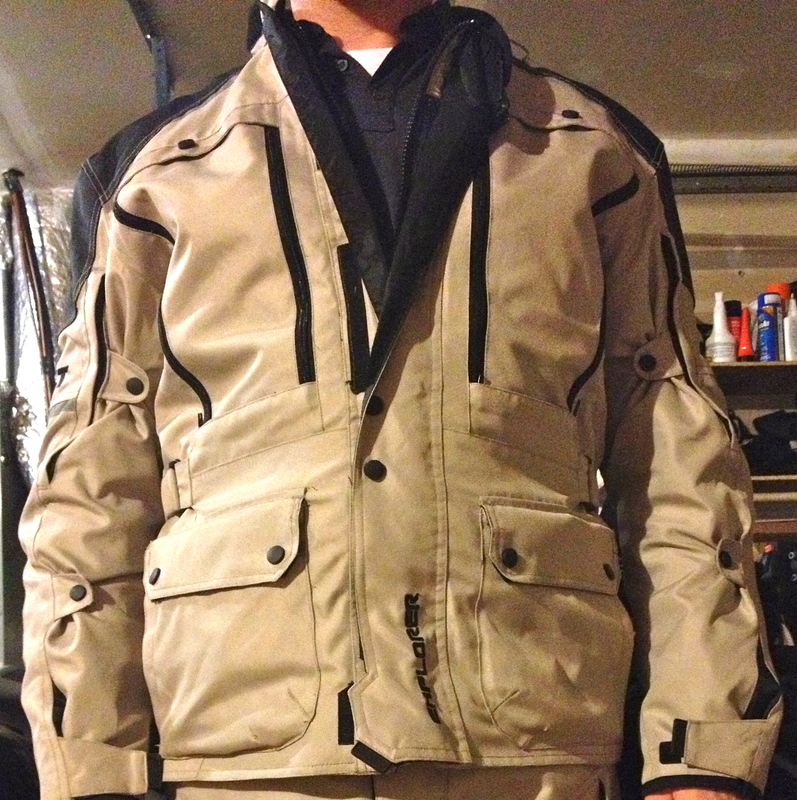 With the liner removed the base jacket has one internal pocket in the lining on the left side. 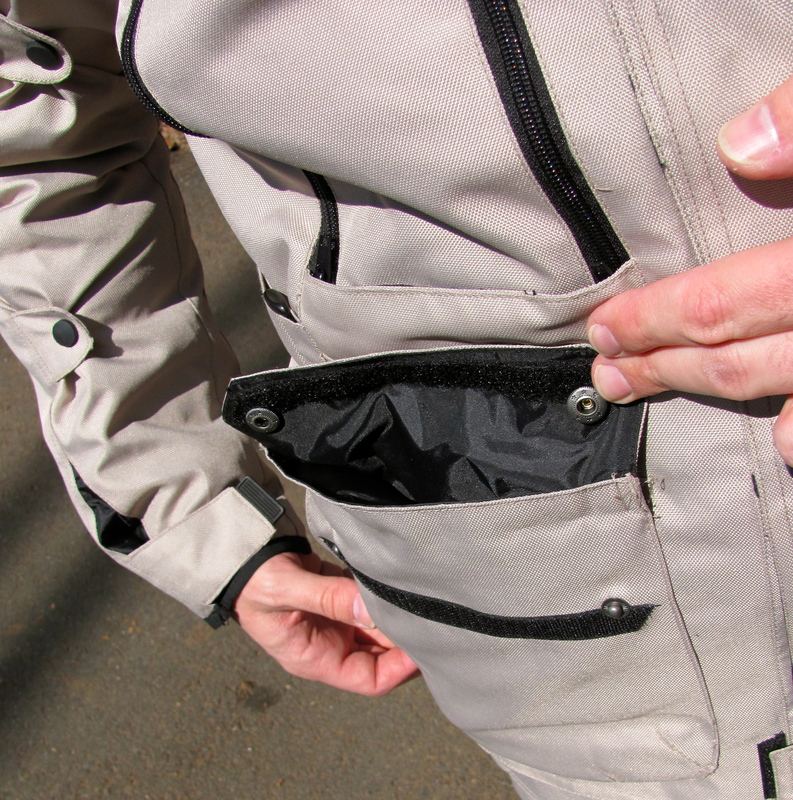 There are two napoleon pockets along the main zipper near the neck, one inside and one outside the main zipper but both lined with waterproof material. 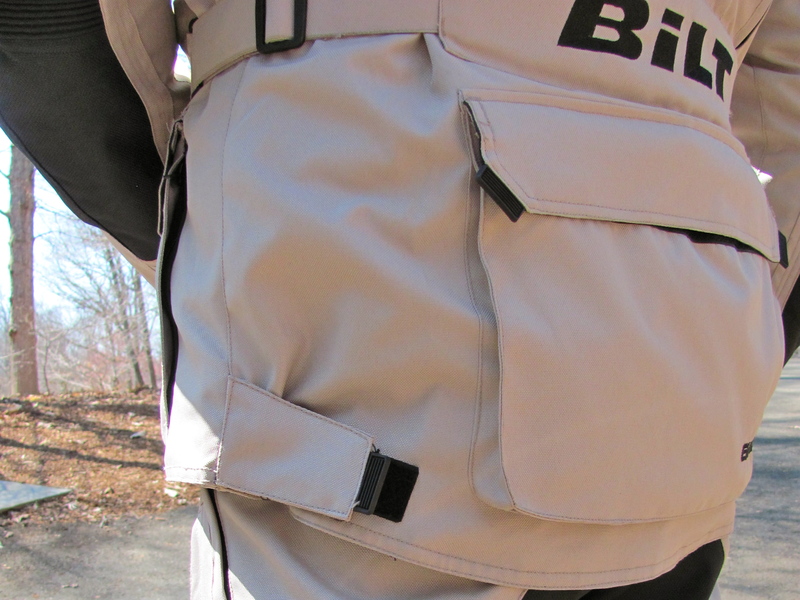 At the waist are two large cargo pockets with flaps that close both with snaps and hook and loop and are lined with waterproof material. 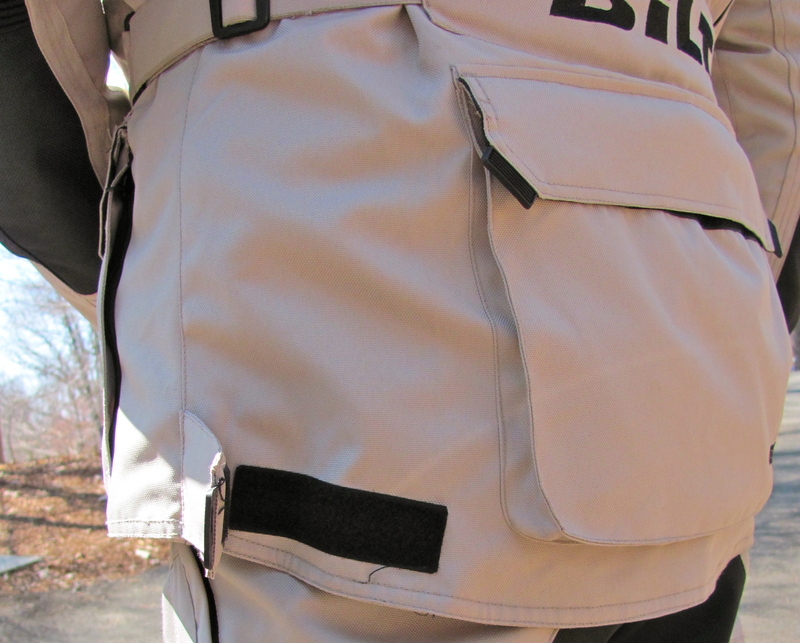 On the side of the cargo pockets are zipper closed hand warmer pockets lined with the same material found around the collar. 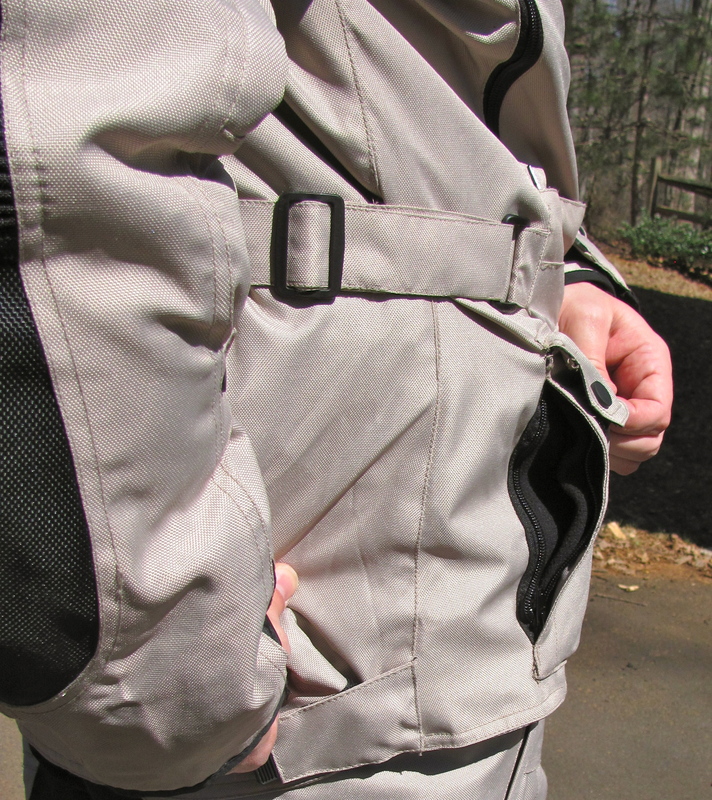 On the back is a large snap closed waterproof pocket the width of the back and from the waist to the bottom of the coat. There’s even a pouch for a hydro pack that sits between the vent zippers. That’s 11 pockets before I even put the pants on. I’m sure to lose something. 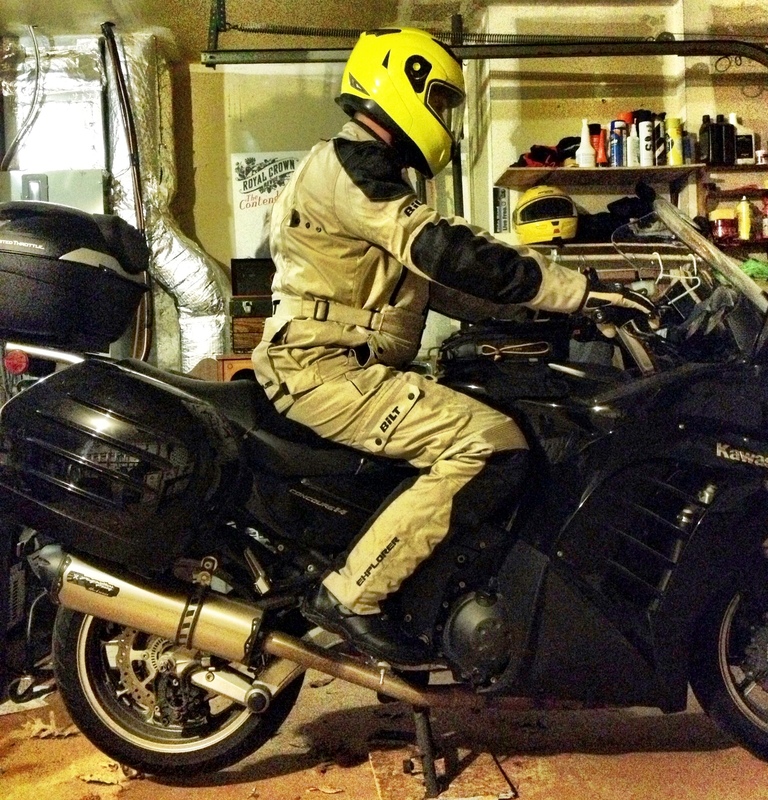 I decided to buy the tan or Sand color for the Adventure jacket and not the all black for better contrast to my bike (which is black) and more conspicuity. There are also reflective panels along the front of the shoulders, above the elbow patches on the side, and at the back of the neck and midway down the back of the jacket. I’ve taken a few pictures with a flash and can say that the reflective spots are placed to offer a good view to motorists in low light and dark riding conditions. 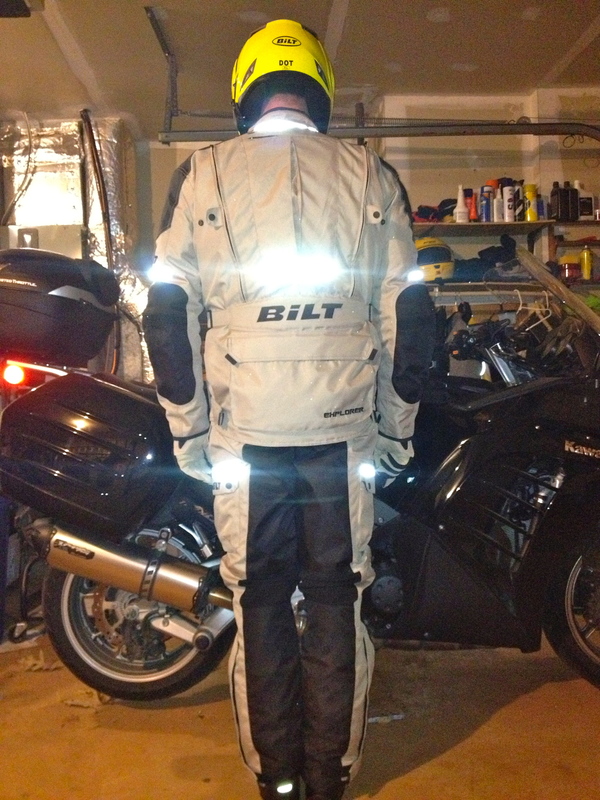 Since this is a waterproof coat I find good placement of the reflective spots a big plus. Shoulders and elbows are equipped with removable CE certified armor pads. I took a shoulder and elbow pad out to inspect and I was pleasantly surprised that it was marked as CE (of that I had little doubt) and that it was pretty substantial (here I was more surprised). 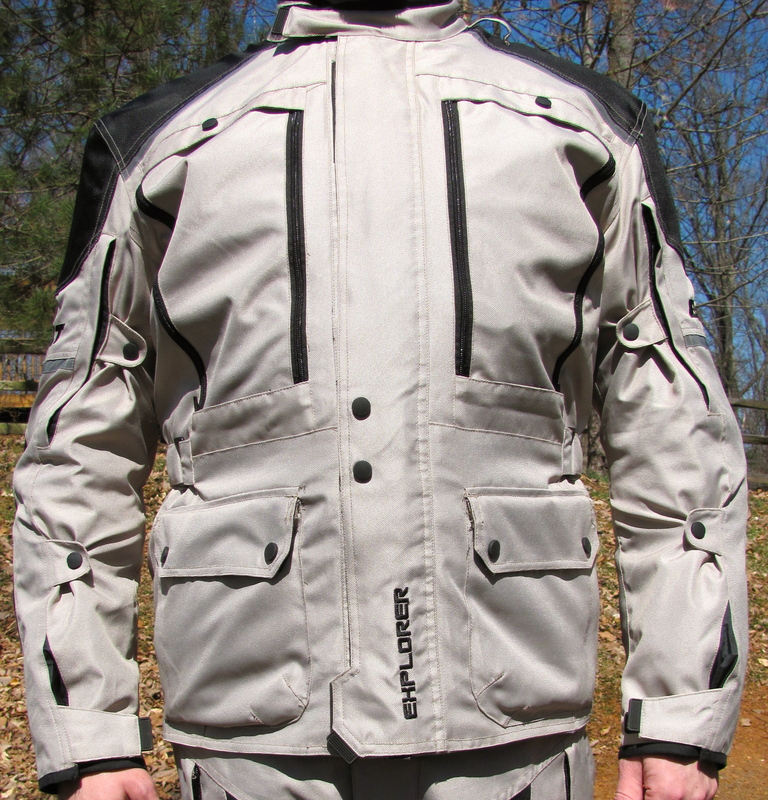 I have several riding jackets and pants that all have CE rated armor, however not all CE rated armor is the same. I’ve seen some pretty flimsy CE armor up to hard molded plastic CE armor. Basically as long as it meets the European Community (CE) standard for impact distribution it is certified as CE armor. I’m relieved that armor was not a place BILT cut corners like some other more expensive brands I own have done here. At this point I’m generally happy about my purchase. It fits right, feels good, looks good, and is put together moderately well. I think that there are more pros than cons when it comes to the gear so far. I think it will serve me well, but not for a long duration. It has real potential to not show wear and tear rather quickly. I also think this is a one-and-done piece of gear should I get into a crash in it. I believe it will protect me as much as the next jacket, but it will not survive to ride another day as some higher end kit might. The real test will be riding with it over the summer and seeing how it handles cold and hot weather and regular daily use. I’ll let you know how it fares later this summer/fall in my long-term test results. 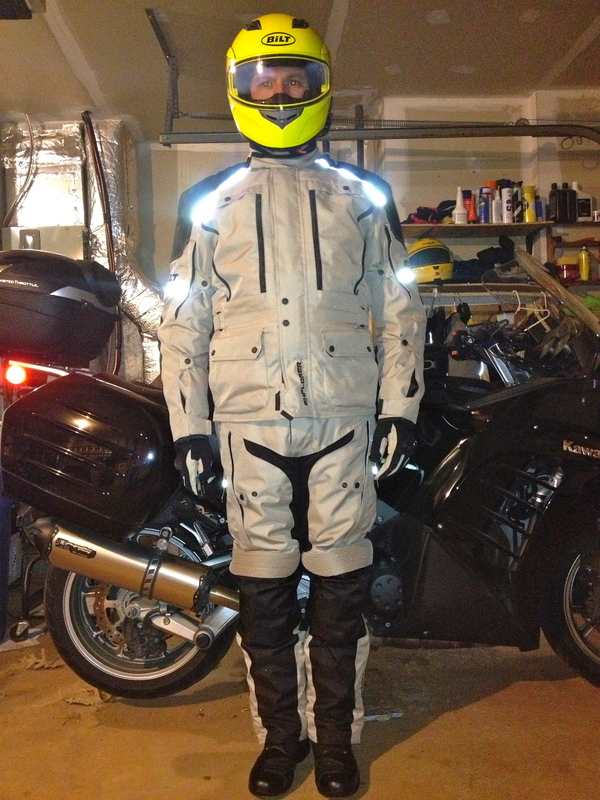 The jacket, pants, helmet and gloves where a promotion package that cost $499.99, and the boots where $79.99. Shipping was free and after taxes the whole kit came to $503. 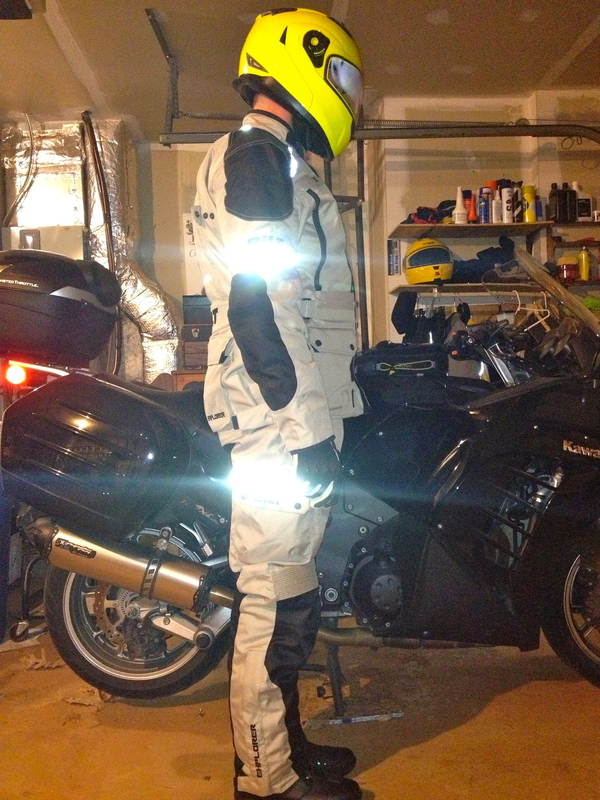 Not bad for a full set of riding gear. I plan to use the gear all summer and write up my thoughts on each item. Look for an initial impression coming soon and then a long term review as I use it this year. I hope that this experiment turns out to be a positive experience because finding a reasonable source for gear would be a benefit to all of us riders. Google Glass for Motorcycles Are these forthcoming “digital glasses” the ultimate navigation and heads-up display for motorcycle riders or just another threat to traffic safety?. The possibilities are pretty amazing for this technology. I personally love the hands free abilities that this would provide both drivers and motorcyclists. My mind is racing with the opportunities and applications. But there is the potential here for more distractions from other motorists. Read the article linked above. Let me know what you think. Is this the next leap in our interactions with technology or is this the next big distraction. I’m hoping for the best.